The game has ended, and since hindsight is 20/20 let's review. A lot of the moves have allready been discussed but there are still some left. fractic: I did not like as played in the game very much. It doesn't pressure black as much as a would and it doesn't protect the corner as much as b would. 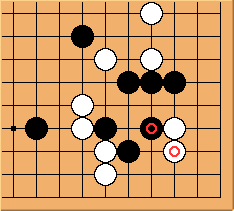 Not to mention that a move around c looks possible due to Black's strange shape. Any thoughts? 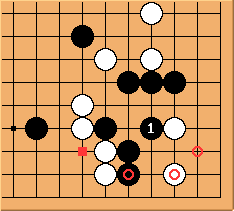 unkx80: I don't know this well enough to make a good assessment, but you should note that White a may promote Black d. I find as played in the game a rather annoying move for Black, because it leaves e open and yet Black has no good local reply. fractic: Black has just played and white invaded at a'with . As mentioned in the earlier discussion this takes advantage of the fact that wasn't played b. may indeed have been the last chance to invade the corner I'm not convinced the timing is right. White allready has 2 corners on the right and the option to take a good part of the lower left corner aswell. How about instead forcing with and following up with one of the . 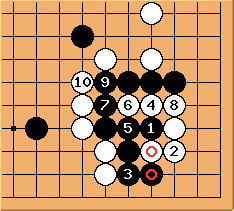 This would help the white group in the top left so that if black later closes the corners with an invasion at c might still be possible. unkx80: In this case, playing the clamp at before peeking at would be an interesting preposition. Scenario: White has just played . 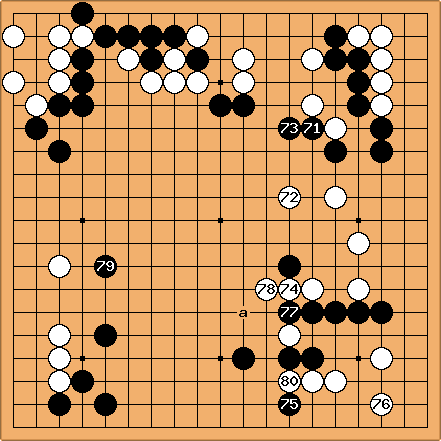 Black is trapped. the peep of has been critisized bcause of White potential move. If you think White is wrong, please give your variation above this diagram. If Black at 'a', White at 'c'. 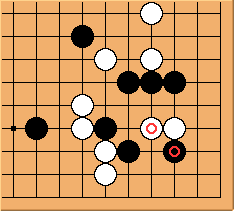 If Black 1 doesn't kill White's corner with circle, the cut at Square should allow Black to connect out. If Black at 'b', White at 'd'. Black has too many liberties for this attack to be effective. If Black at 'c', White at 'd'. 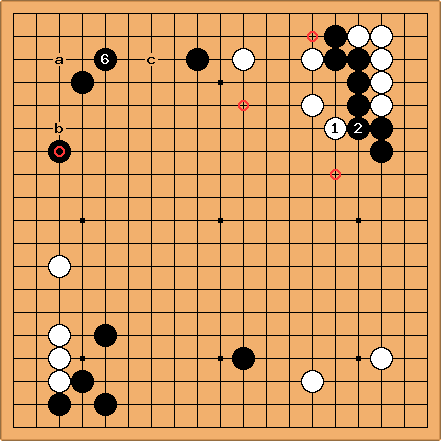 White has won the corner if Black plays like this. If Black at 'd', White at 'e'. Followed by Black 'a', White 'b', Black 'c'. Black seems Okay with this continuation. If Black at 'e', White at 'f'. If Black at 'f', White at 'e'. unkx80: It is difficult to describe what the flow of the game is like, to me it is something that is pretty much an acquired feeling. Here I try to give a commentary mainly on the flow of the game as best as I can. unkx80: is not proactive, but has the feel of chasing Black's already strong group from behind. But overall, both Black and White seem to play with the flow. unkx80: With the bottom left side still weak, it seems premature to tenuki to play . But when gets to go back and patch up, the position looks pretty okay, as if the flow was not broken. The only thing I am not sure is, what is gained or lost by the exchange of and . unkx80: seems somewhat against the flow by deliberately entering the corner instead of making an extension on the upper side, inviting to separate and . However, I cannot say for definite that is a bad move. unkx80: has been criticized for making too narrow an extension, but till the flow is there. 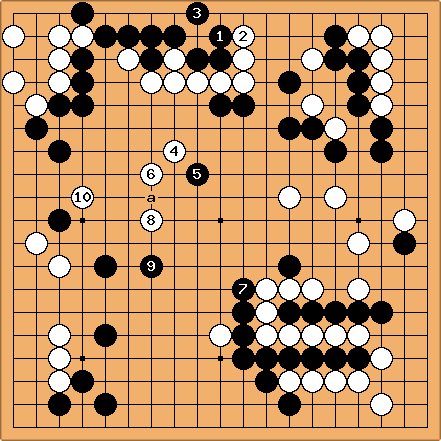 unkx80: For I would not play a large knight's move to invite an invasion into the corner, I would consider a or b. Balance in territory is important. unkx80: followed by are two tenukis, but no big harm here. But with , there is always a danger that White might just peep at a first. 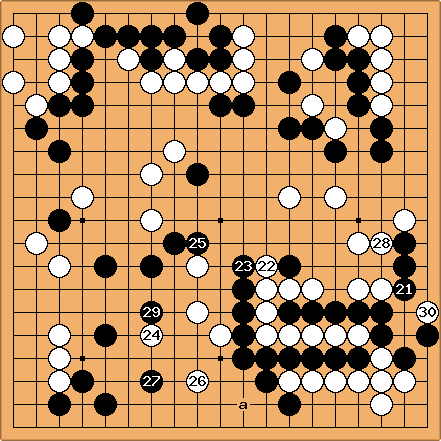 Actually seems like poor technique, I would prefer to finish the sequence by playing at first to obtain sente, and then come back to either or b.
unkx80: I would have thought that Black should finish the corner business before playing at . Because things do get slightly complicated after . This is what flow is about. When comes back to hane, missed a chance to peep at , but is a mistake that allows the peep at . There are errors in and , but I can sense the overall flow of these moves. and are the first two moves that start to make the game messy. Actually, it shows some technique by allowing not to be captured, but I am not sure of the utility of these two Black stones stuck against the White wall should Black escapes with a. 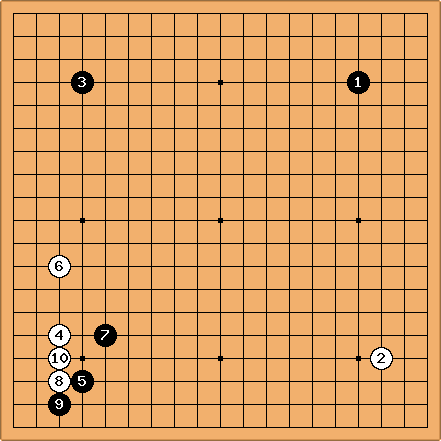 Definitely, these two moves are somewhat against the flow. unkx80: is generally thinking but seems to have a shape problem, but is very wild and against expectations. unkx80: is too weak a move, should definitely first consider either or a, whichever is the better move would require reading. unkx80: is like pushing the cart from the rear, probably a would make a better move locally. But it also shows the dubious value of . Actually, can also consider responding to with b or c, making the stones work better. unkx80: might be better played at d.
unkx80: The flow in this diagram is generally smooth, although I do admit that I am a little surprised that didn't put up more resistance. I already made some comments on , and has also been commented upon. Owing to the weakness induced by , can consider playing at a instead to strengthen the group. unkx80: is a beautiful move, which Black responded with , so the sequence from onwards to separate the five stones becomes natural. However, it is so against the flow and cost a lot of points to throw the five Black stones away. 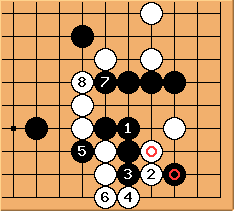 Isn't there a chance for Black to play in sente at some point in the sequence to gurantee connection? unkx80: The tenuki at leaves unfinished business at the bottom right corner, and is very big, leaving almost no aji in the area. The five Black stones appear to be sacrificed without appropriate compensation. 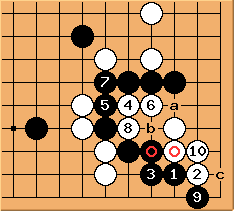 At the bare minimum, should be played at , getting the three White stones in sente. unkx80: With moves like followed by , flow is almost absent in this diagram. unkx80: Just as an attack is underway, especially with the soft move of , has to break the flow and tenuki. No doubt is a big move, but is even larger, giving more breathing room to the White dragon and significantly reducing Black's framework. 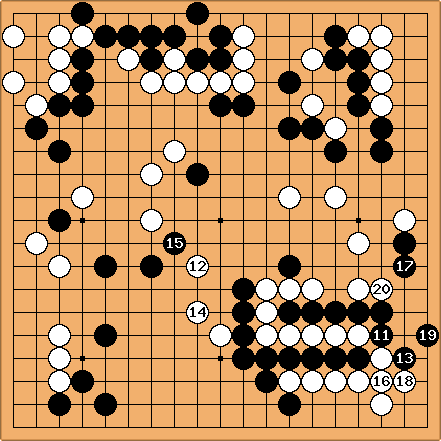 has to continue the attack with a, and I am pretty sure that Black will eventually get sente and come back to play . unkx80: Can live? I do not know. and are so against the flow by leaving the business at the lower right side unfinished, but probably because some members of the White team think that White is behind and needs extraordinary moves to turn the game around. unkx80: should finish the business at the bottom right corner. The value of , , and at or , is definitely more than forty points because it saves the five Black stones as well as turning White's corner into Black's. On the other hand, even with and , the reduction of Black's framework is definitely less than thirty points. So the exchange is very much favourable for Black if finished the business. unkx80: With connecting, Black has to make life, but saving the five stones is still very large. This helped Black to turn the game around. unkx80: is an overplay, the responses at and are good. 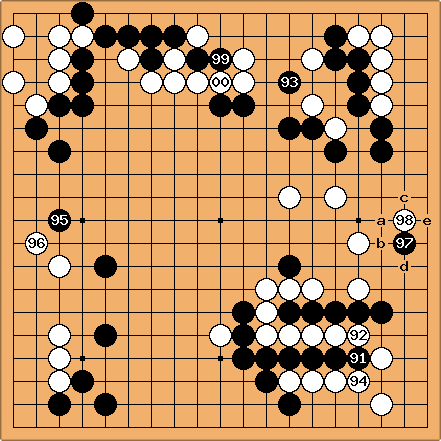 Note that Black a is sente against the corner White group. unkx80: Attaching at is bad style, but it still works. unkx80: White's chances of living is small, so the White team decided to resign. 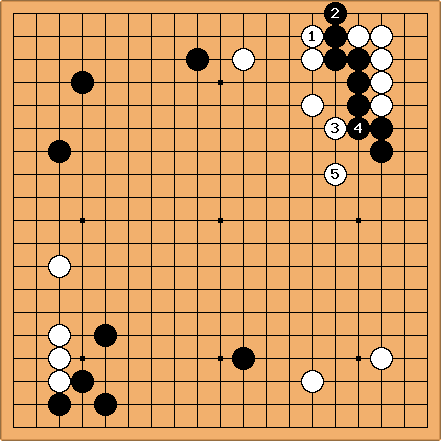 fractic: Note that black a or b would threaten to kill the corner with a monkey jump. Because of this White can't make good eyespace along the bottom.